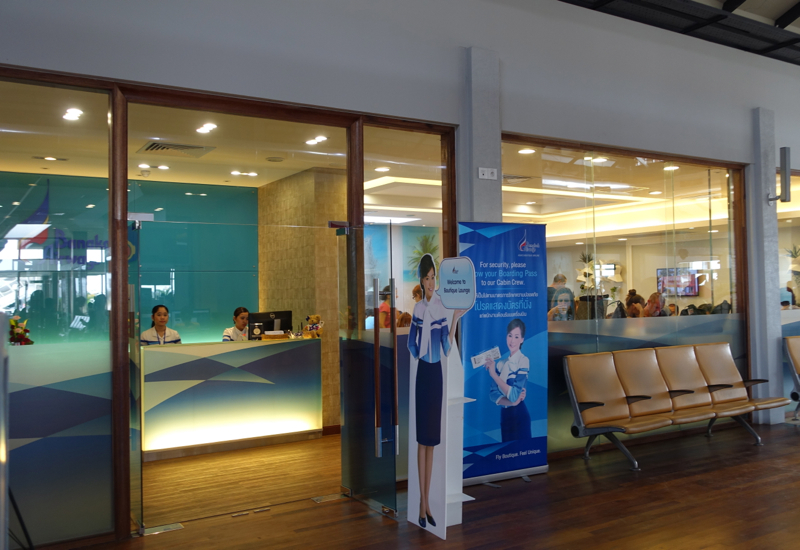 If you have short intra-Asia flights to or from Bangkok, chances are that you've flown Bangkok Airways or considered it. We've flown Bangkok Airways a few times, to and from Koh Samui last year and also the following flight, from Siem Reap to Bangkok. Most people reading this post will end up booking paid Bangkok Airways flights, since Bangkok Airways' frequent flyer program, Flyer Bonus, only has 3 partners: Etihad Airways, airberlin, and Japan Airlines (JAL). Unless you happen to be based in Thailand and fly Bangkok Airways a great deal, it probably won't make sense for you to credit to Bangkok Airways. I was lazy and credited to Etihad since I had an Etihad account and not a JAL account and our flights have been so short anyway, but if you think you may use JAL's distance based award chart, for example to fly Emirates between the U.S. and Europe (see Emirates A380 Between U.S. and Europe and How to Book Awards) then you may want to credit to JAL. 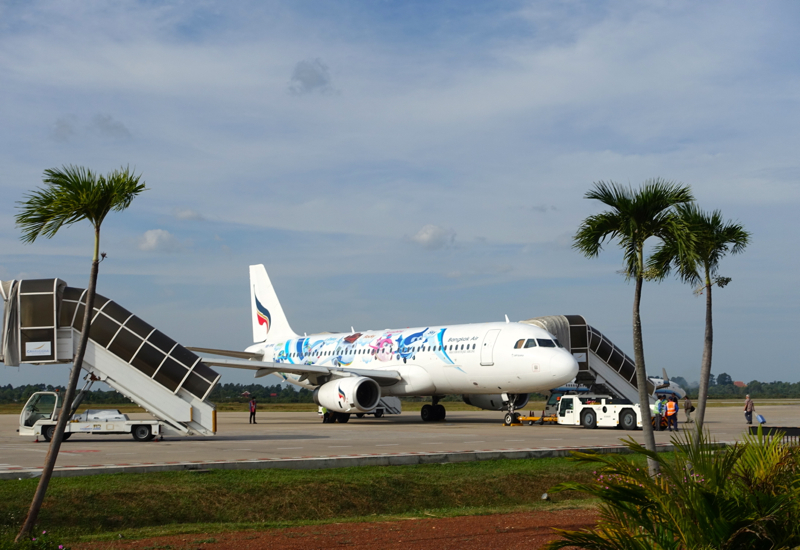 Bangkok Airways operates Airbus 319 and Airbus 320 aircraft, with economy seats in a 3-3 configuration. 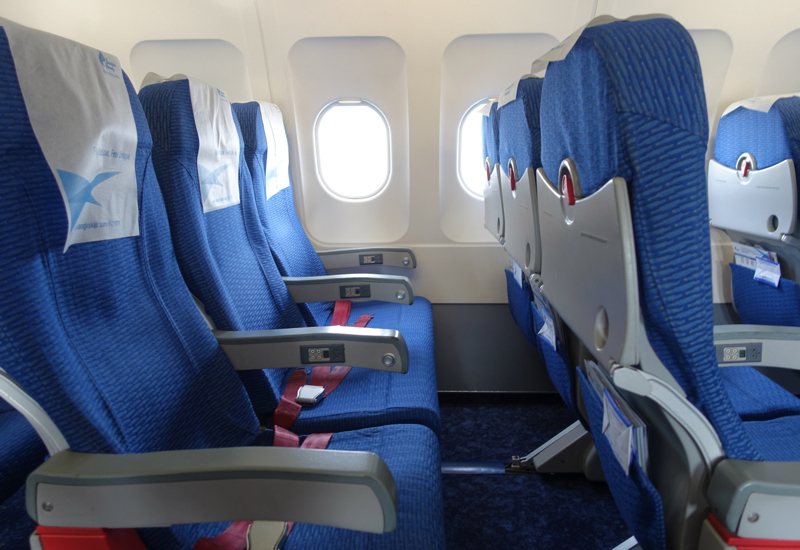 On most of its A319 and A320 flights, premium seats are just the 3 rows in the front, with the middle seat blocked (similar to intra-European flights such as Lufthansa Business Class short haul European flights). Some A319 do offer 3 rows of “Blue Ribbon Club” business class, though still of course with recliner seats, albeit in a 2-2 configuration. 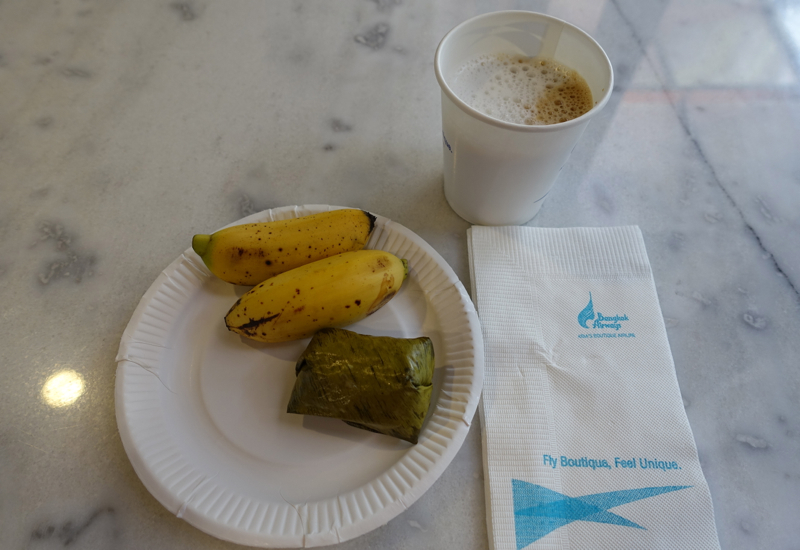 While Bangkok Airways' slogan “Fly Boutique, Feel Unique” is a bit over the top to describe Bangkok Airways' product, it is more than decent in the context of how downgraded domestic U.S. service has become. 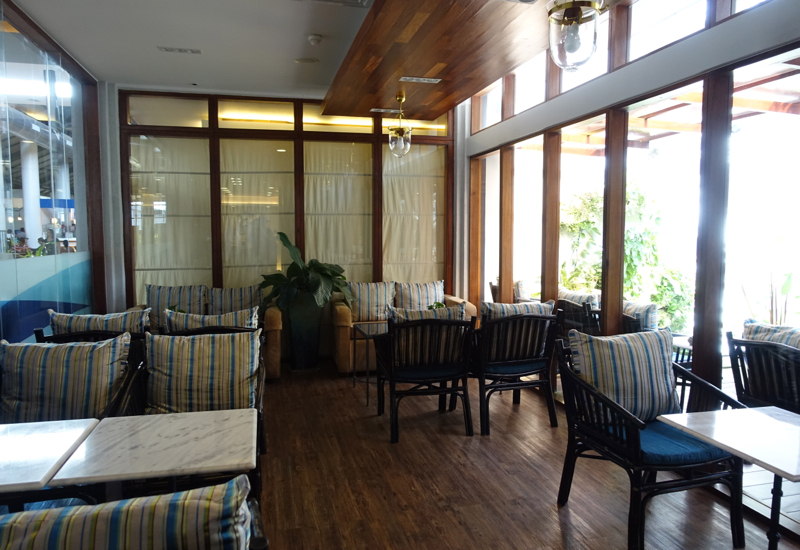 The feature I like best is that there's a lounge, even in as small an airport as Siem Reap (REP). Fortunately, the left side of the lounge was quite empty, with just one table that had a “reserved” sign on it. There was even a little outdoor area, although unfortunately (or fortunately, if you're a smoker) it reeked of smoke, since it provided the main outlet for smokers. Almost all the food offerings are cheap sweet things rather than savory (with the exception of popcorn), but at least there were fresh baby bananas, and they were tasty. 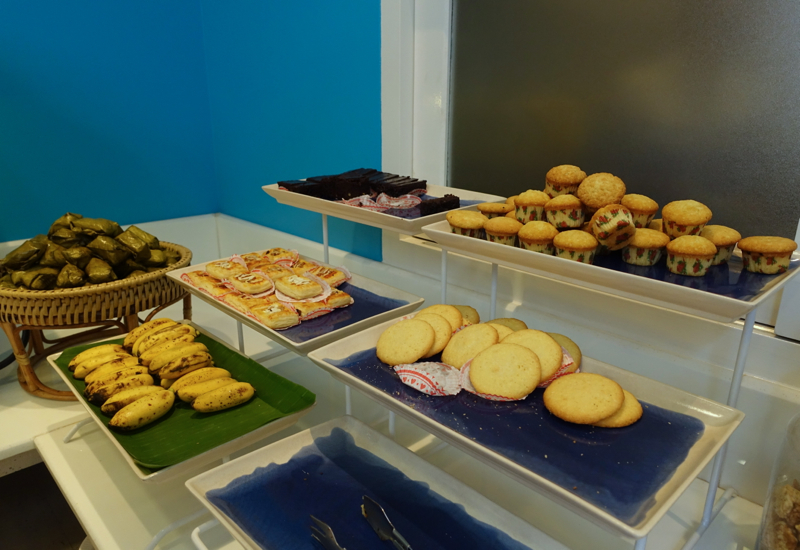 I love when good quality fresh fruit is offered at airport lounges. Boarding, at least at Koh Samui and Siem Reap, is from the tarmac. Your tickets are checked, then you walk to the plane and climb the stairs to board. 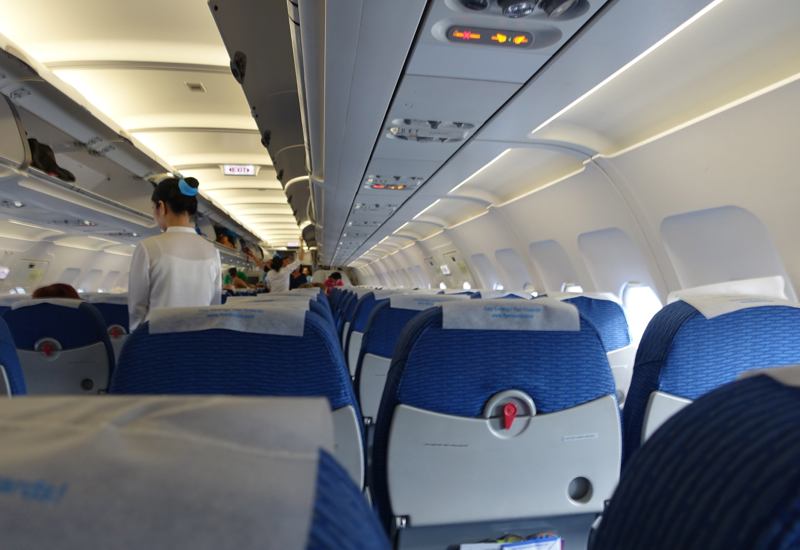 The seats themselves are nothing special–very limited recline, as you'd expect, and no in flight entertainment–but fine for the 1-2 hour flights Bangkok Airways normally flies. 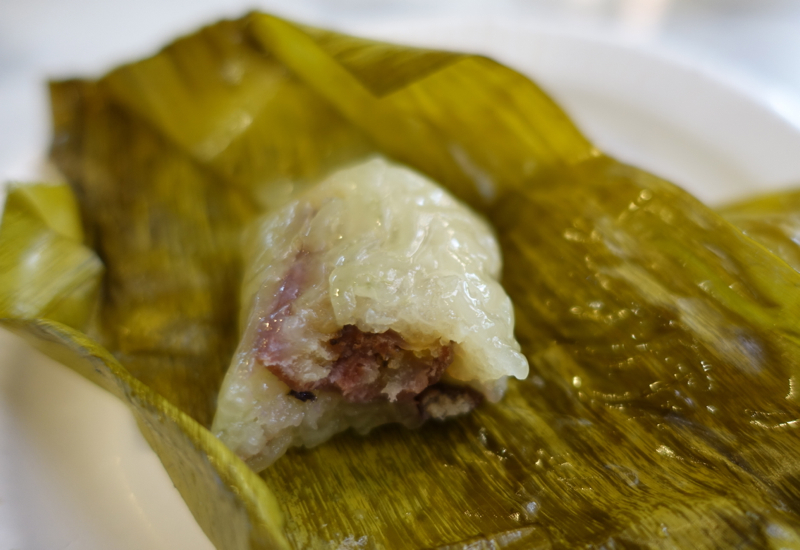 I think Air Asia has a much better model when it comes to food–yes, you pay something for it, but the offerings, especially Nasi Lemak, while still airplane food, are so much more palatable than what Bangkok Airways serves. I'd take paying a few dollars for something better any day over creating so much waste, since I wasn't the only one who didn't care for the meal–many of them went right back into the service carts untouched, except for the water. So far our experience with Bangkok Airways has been mostly fine in terms of the things that matter for a low cost airline: close to on-time departures and arrivals (with the glaring exception of our flight from Chiang Rai to Bangkok, which was cancelled just a few days before we were to take it), efficient and friendly enough flight attendants, and even a lounge for economy passengers, which in my view is the best feature. I still recommend bringing your own food, however, if you think you'll be hungry. 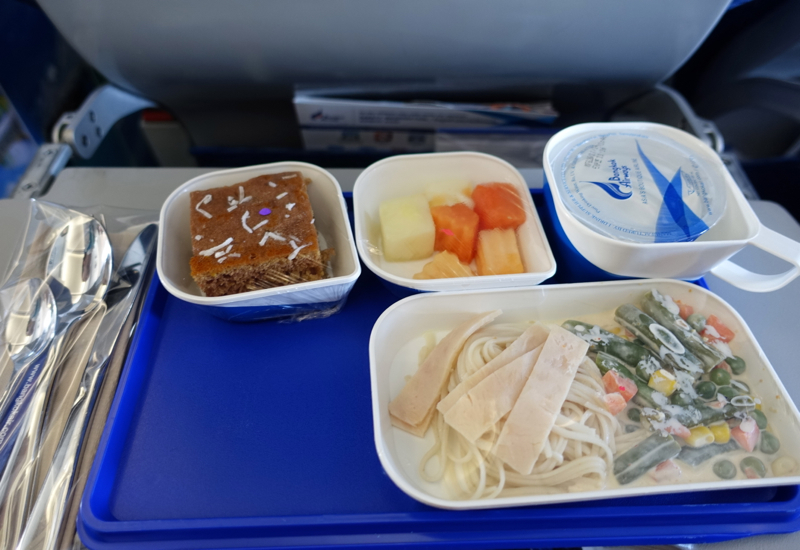 If you've flown Bangkok Airways, what was your experience? 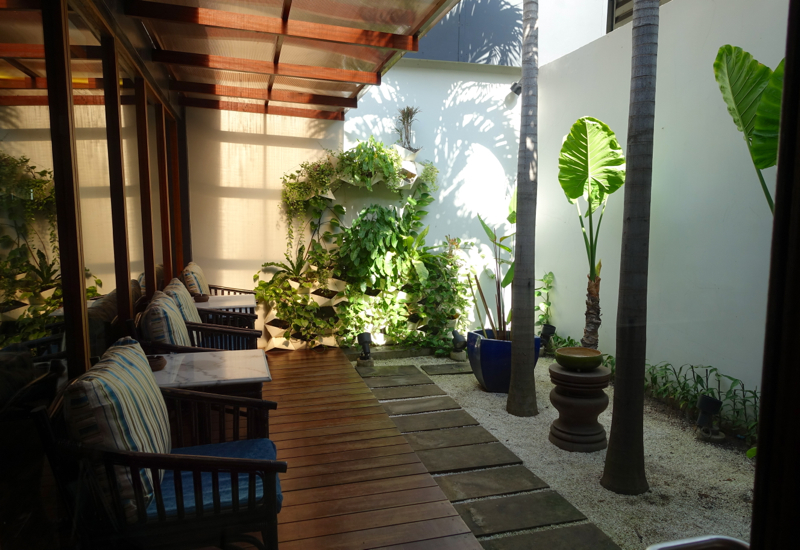 Become a TravelSort Client and Book Amansara with Virtuoso Amenities!